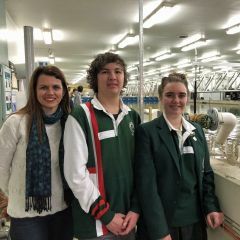 High school students from across Tasmania learnt about the positive contributions that engineers make to their communities and the potential career paths within the sector as part of the Engineers Australia Futures in Engineering program. The Year 10 and 11 students met with engineering professionals and attended career pathway presentations, as well as touring the teaching and research facilities at the University of Tasmania’s School of Engineering and Australian Maritime College. Engineers Australia Tasmania General Manager Dr Vicki Gardiner said 95 students – 54 in Hobart and 41 in Launceston – attended the program, which aims to get more people interested in the field of engineering. “The great news this year is that some 40 per cent of the students are young women interested in engineering,” Dr Gardiner said. For the future of the industry and the state, this is very encouraging. Research has proven that the more women we have involved in professional workplaces, the greater the outcomes, innovation and productivity. The students learnt about the factors that maritime engineers consider when designing boats for their operating environments, and saw this theory in action during a demonstration of the impact of different sea states in AMC’s model test basin. Samarah Braid and Crispin Mills, from Devonport High School, both have an interest in science and maths and said the program had provided a great insight into what being an engineer is all about. “I’m here because I haven’t got a view on what I want to do when I leave school,” Samarah said. The Futures in Engineering program is run by Engineers Australia with support from Defence Force Recruiting, Caterpillar, the University of Tasmania and the Department of Education.